There’s a song we sing at the beginning of every car trip–well, every trip that’s longer than an excursion to the grocery store. The song is from a musical I’ve never seen, based on a Rumor Godden novel I haven’t read, but I love the original cast recording. The song is great fun to sing as we venture down whatever highway is next. A weekend jaunt to Paris would be nice. Christmas in the Bahamas sounds like fun. A marathon run along the Great Wall of China would certainly be memorable. But those destinations and a thousand more are still a little out of reach. We’ve gone to the theatre many times, visited family and friends, and become regulars at Home Depot, but time, energy, and budget have not yet permitted more extravagant travel. For my birthday, she gave me a subscription to a service called Taste the World. Every two months for a year, we’ll receive a package that takes us on a virtual-culinary visit to someplace new. In addition to food, each trip-in-a-box contains recipes, cultural information, and a playlist of appropriate music. Of course we could go to a French or Szechwan or Ethiopian restaurant, but cooking with the ingredients ourselves seems more fun than choosing something from a menu. The first box arrived. It’s very classy looking, about 8 inches square and 4 inches tall, pale green in a shade that reminds me of Tiffany blue–but maybe I’m thinking of jewelry stores more than usual these days. We opened the box with anticipation. We’re going to Marrakesh! 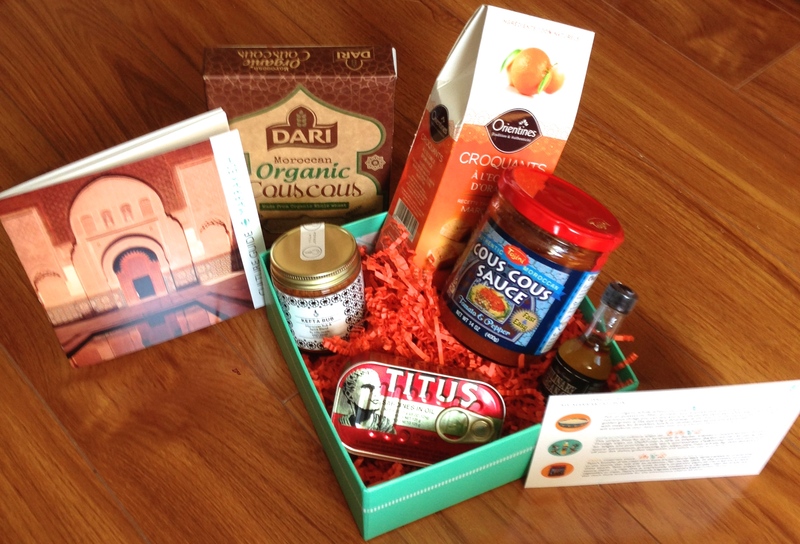 The box contained organic couscous, orange-peel cookies, tinned sardines, kefta rub, couscous sauce, and culinary Argan oil. The accompanying booklet was filled with poetry, beautiful photographs, a link to the on-line playlist, and a few recipes. Oddly, they weren’t recipes that call for the items in the box. We put the booklet aside, ported the playlist to the stereo, and figured out what to do for dinner. The couscous was simple enough: toast it in a dry pan, add some boiling water, cover, and wait, then fluff with a fork. I was a little disappointed in finding pre-made sauce–at first thought, it seemed like using a jar of Ragu to represent a trip to Italy. But there was a time when tomato sauce was exotic to American cooks, so I tempered my expectations and opened the jar. The sauce was sweet, a little smoky, and a little tangy, tomato-based and fairly thin. Pouring it over couscous alone sounded awfully boring, and not much of a main dish. She doesn’t like sardines–and after my tinned-fish pizza experience, I wasn’t game for them either–so I pulled some chicken out of the fridge and simmered it in the sauce along with a little onion and red pepper. Chick peas would have been appropriate, too, but we only had dry ones at hand and didn’t want to wait until morning for dinner. I chopped some spinach and added it, too–there should be greens! She was concerned that it was such a lot of spinach, but it cooked down to almost nothing in no time flat. Dinner was great. Was it authentic? I don’t know. We poured a jar of sauce into a pan and cooked some chicken and vegetables in it. We probably had all the ingredients for the sauce in our pantry, though we might not have used them in the same combination. (Without a recipe, who knows?) The couscous tasted like any other couscous I’ve had–microscopic grains of pasta. We didn’t use the kefta rub on the chicken, fearing the sauce would be too spicy. The argan oil will wait for a day when we have flatbread in the house. The orange cookies were breakfast on Saturday morning. They’re cute little things, looking as much like dog biscuits as treats for people–dense and grainy, made partly from almond flour, faintly sweet and nuttily fragrant, with a piece of candied orange peel in the center. They were fun, served with a ramekin of whipped cream for dipping. I wouldn’t buy them from a market shelf, but they might be fun to make if we had a recipe. 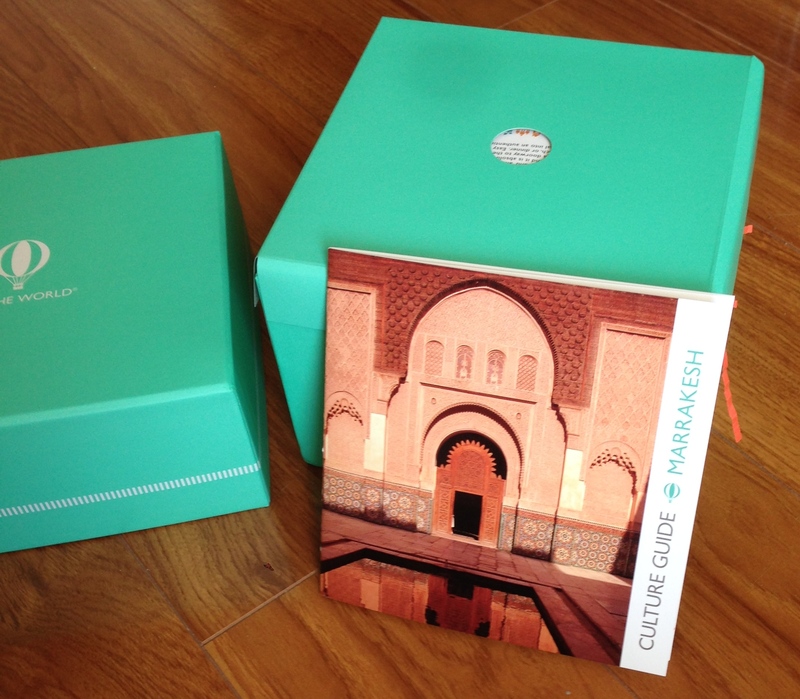 Based on this box, I’m not inclined to call my travel agent and book a trip to Marrakesh. Based on this box, I might not even be really inclined to order a second Taste the World box. But I do look forward to finding out what’s in the next one, and to where we might “go.” And to where we might go. 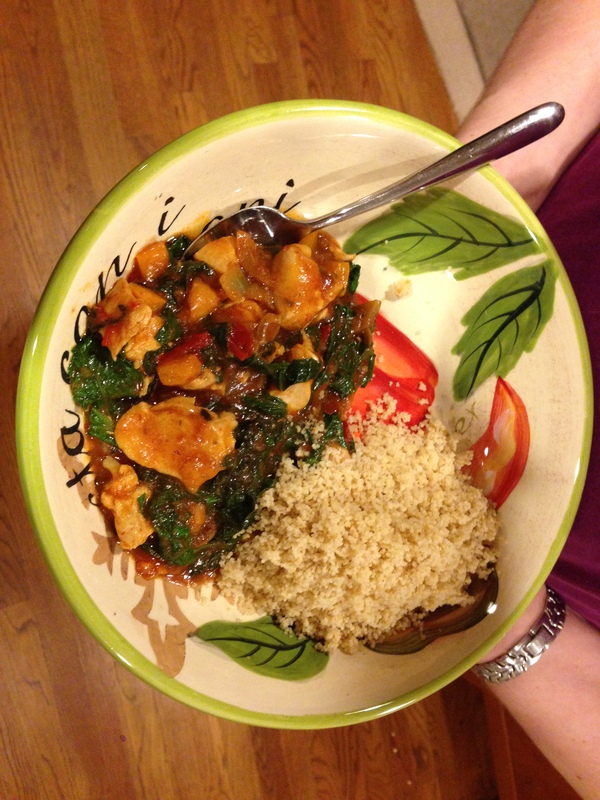 This entry was posted in Uncategorized and tagged Chicken, Couscous, Recipes, Reviews, Sauce, Travel. Bookmark the permalink. I love the idea of this birthday gift, particularly that it lasts for a year. Shame the box wasn’t quite as thought-through as it might have been, but at least you are creative enough to make the best of it. Good luck with the next one!